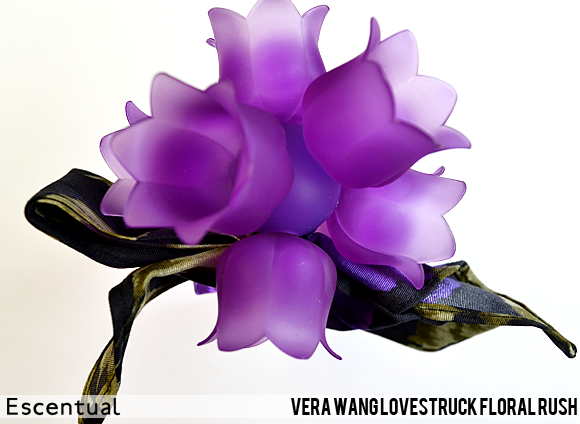 The new Vera Wang Lovestruck Floral Rush is a new interpretation of the original Lovestruck scent, with greater emphasis upon sparkling springtime florals. Upon first glance at the flamboyant bottle, I was expecting something very sweet, but I was surprised to find that Lovestruck Floral Rush is in fact a lightweight and sparkling floral. The Floral Rush portion of the name is very apt – the notes are effervescent, almost bubbly, creating a happy-go-lucky ‘rush’ sort of feeling. It is described as a scent “inspired by the rush of a dizzying romance, when your heart beats a little faster and the world seems a little brighter, Floral Rush fizzes and sparkles with delightful notes”, and this it definitely true. It feels young and carefree, a feeling that lasts right from the champagne accord in the top notes, through to the heart of pink passion flower. Even the sensual cashmere wood base doesn’t detract from the feeling of lightness; the dry down is a little more creamy, but the glittering almost-citrus champagne tones can still be detected. Like the original Lovestruck, the distinctive cap of Floral Rush is comprised of a plastic bouquet; six blooms that sprout from a spherical base. Though this makes it almost impossible to carry around with you, it makes for a beautiful addition to the dressing table! The bottle is finished off with a couture fabric bow, a floral pattern in shades of green and purple. As it is affixed to the base of the cap rather than the bottle itself, it won’t get sodden with perfume with every spray. Overall, this is a very easy to wear, romantic fragrance that is a great choice for spring. It’s most definitely a daytime scent, but its lightness means that you could layer a deeper fragrance on top for the evening to add a bit of sparkle. This entry was posted on Thursday, January 24th, 2013 at 11:26 am and is filed under Fragrance, New products, Tried & Tested. You can follow any responses to this entry through the RSS 2.0 feed. You can skip to the end and leave a response. Pinging is currently not allowed.